I’m quite late to post this bake, lucky the dateline is still not over yet! 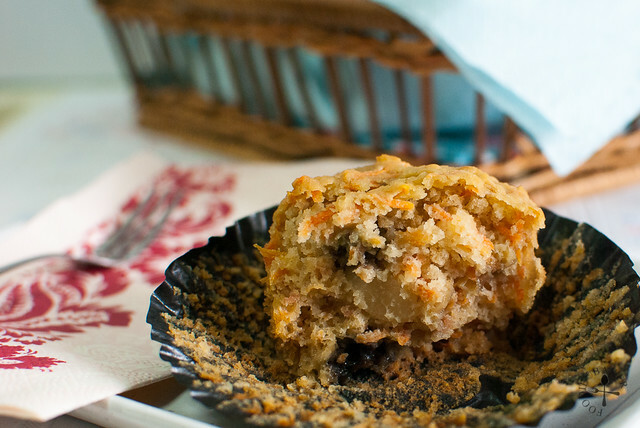 The bake this time round is chosen by Lena from Frozen Wings, and this is such a healthy bake! This is definitely not a difficult cake to bake – the toughest is probably the grating of carrot and apple! 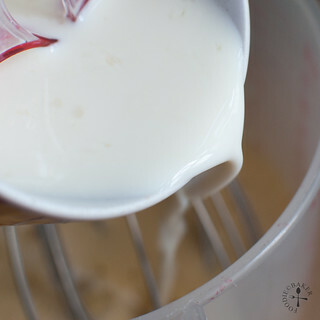 If you have a food processor, it will make the assembly of the cake even quicker. Taste-wise, this is one of the moistest cakes I’ve ever tasted and I feel very healthy while eating it, knowing that there’s oats, carrot and plenty of fruits inside! I probably shouldn’t have forgotten the cinnamon-sugar topping because I found the cake not sweet enough. That’s right! For the first time I didn’t reduce the amount of sugar stated in the recipe and I still found the cake not sweet enough! Nevertheless, this hearty bake is definitely for those who wants a healthy option for breakfast – I will not feel guilty even if I eat two of them for breakfast! 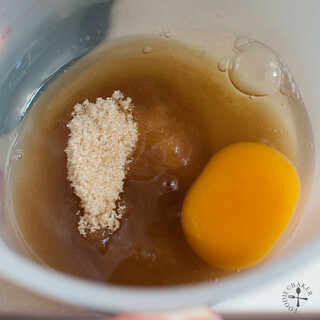 Here are the step-by-step photos for the bake! 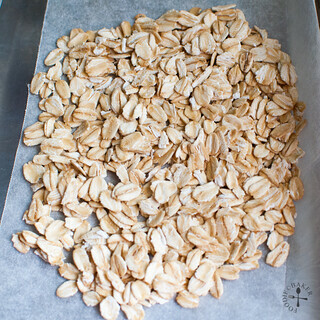 1) Toast the oats at 175C for 10 minutes. 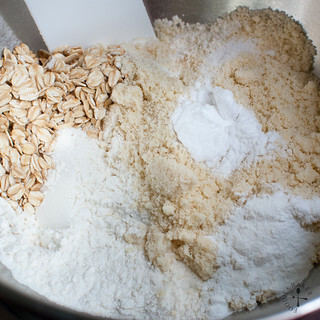 2) Oats, flour, baking powder, almond and salt. 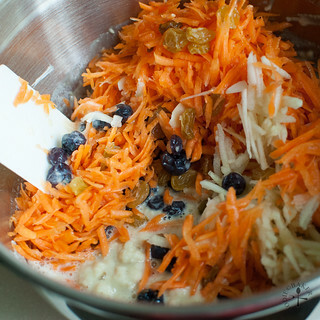 3) Carrot, almond, apple, blueberries, raisins. 4) Brown sugar and egg. 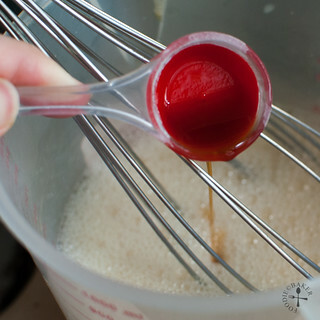 5) Whisk together! 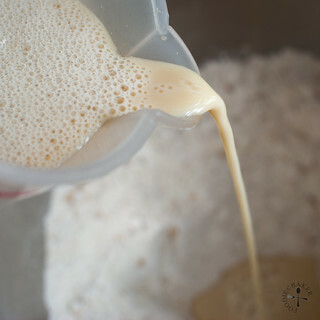 6) Add in buttermilk. 7) Vanilla... 8) And some sticky honey. 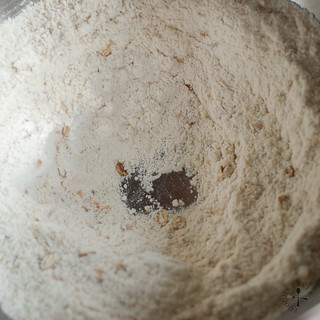 9) Make a well in the dry ingredients bowl. 10) Pour the liquid in. 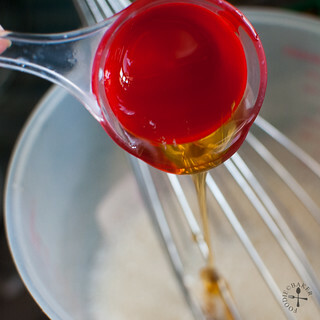 11) Add in the rest of the ingredients. 12) Scoop and bake! 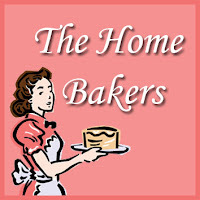 This bake is linked up to The Home Bakers, click HERE to see other home bakers’ bakes! A great thanks to Lena for choosing this bake! I divided the batter among 6 muffins (1/4-cup each) and baked them for 20 minutes at 175 degrees Celsius. For the full recipe, please head over to Lena’s (Frozen Wings) blog! Thank you for the invite Carole, bringing some over right now! 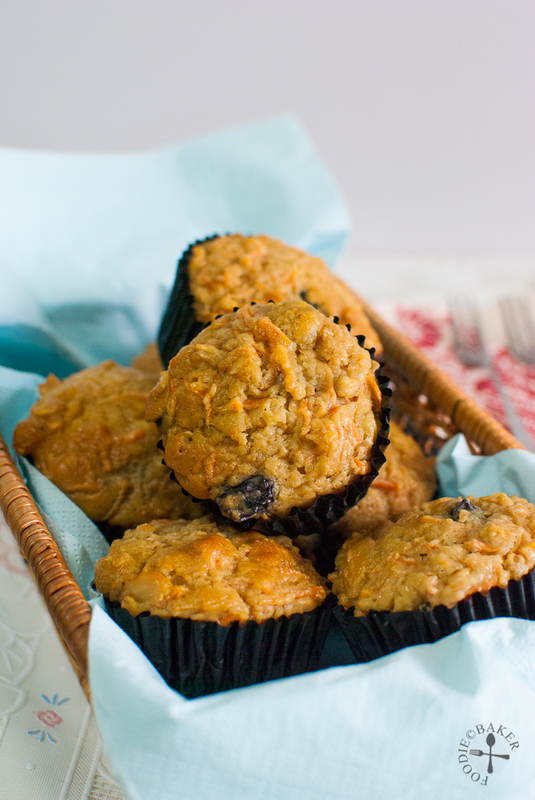 Morning glory is the right name for these muffins. I love everything about it. Hi Balvinder, thank you for the compliment! yeah, glad that the grace period given is one month to post..i have been late in many of the posts too ! agree that this cake is really super moist and it stays that way too even after refrigeration! i also like the little chewiness of the cake, i guess it’s from the oats..maybe :)thx for joining me to bake this cake! i bookmarked this, and forgot about it… after looking at yours, i’m so inspired to do it!!!! i need forces from people like you! ichiban! This cake looks soo good . Only looking at the ingredients makes my mouth water. These do look like sun-shiny cakes! Haha yes indeed, my friend! Have a great week ahead! 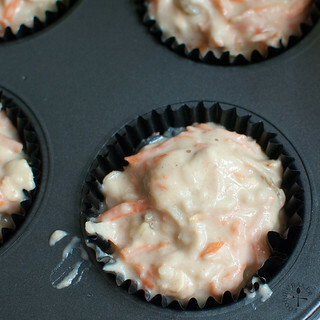 I’ve made muffins similar to this before, but I totally forgot about them! Thanks for the reminder, and next time around, I’ll be trying your version! They look delicious. Hi Rachel, thank you for stopping by. If you do try out this version, do let me know how your bake goes! Happy baking! Your photos are lovely! Making these into cupcakes makes it looks pretty! 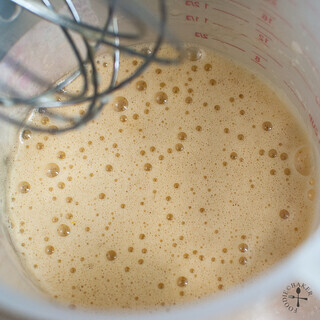 At first I was worried too that the batter would not be enough, but surprisingly it bakes up really well. But this is not one of my favourite bakes from this book. On the plus side, this is one high-fiber bake! 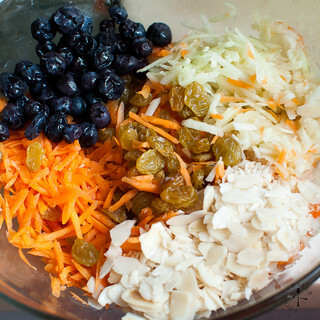 HI Jasline, you know what, this recipe should be renamed as “Happy Morning Glory breakfast cake” coz I just enjoy looking at the ingredient pictures so much, esp the 3rd picture that shows carrot, almond, apple, blueberries & raisins in there! What a special recipe this is! Hey, Jasline! Sorry that I lot track of you for a spell — but I’m here now and just in time. 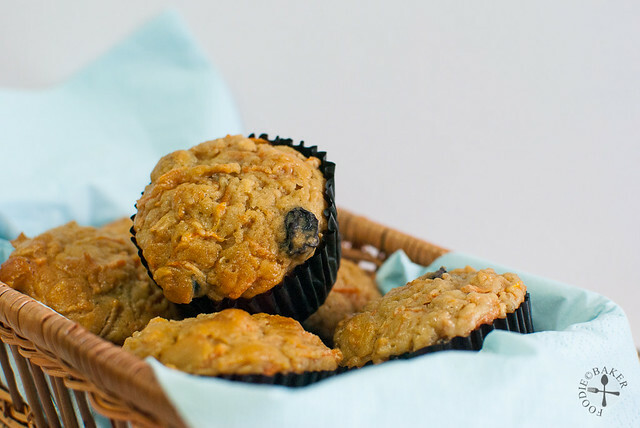 Today’s muffins sound great. 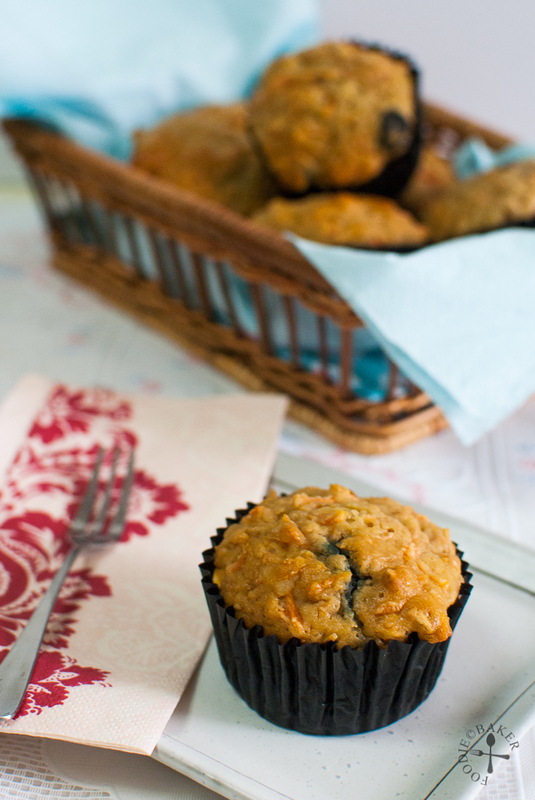 Love that they contain blueberries as well as grated carrot & apple. I bet they’ve very flavorful and would go well with a cup of coffee. Hi John! You have been dearly missed! 🙂 Thank you so much for the compliment! A cup of coffee sounds great! Love the color and texture of your cake crumb! Looks DELISH! Wow looks so healthy and yummy! Adding this to my to-do list! Thanks for sharing the recipe! Hope to see this cake being featured in one of your many lovely bentos!